Every week, GINX TV hosts two marathons on our Twitch channel, featuring our most in-demand shows so that you can catch up on everything you’ve missed. 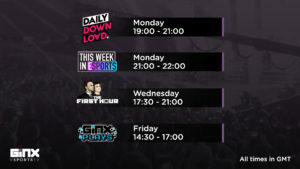 Starting on Monday at 7pm, you can watch every episode of The Daily Download that you may have missed in the last week, seeing you right through to 9pm ready for This Week In Esports to go live. Then, from 5:30 PM until 9pm every Wednesday is The First Hour Marathon. You can see the episode listings below.